This post is by Mark Faggiano, founder and CEO of TaxJar – a service built to make sales tax compliance easier for multi-channel ecommerce sellers. Even if you’re not based in the U.S., there are some international implications of sales tax you should be aware of! When you started selling online, chances are you got into it for the thrill of selling your handmade product, making a profit on a thrift store find, or the joys of online arbitrage. When lost in the thrill of the sale, it’s easy to overlook the nagging administrative details you’ll face. And one of the most vexing of those can be sales tax. This in-depth guide will walk online sellers through the basics of sales tax, help you determine where, when and how much you’re liable for sales tax, and detail some common scenarios and problems. Read on for more information. Or if you have a specific question, feel free to skip ahead. Sales tax is considered a “pass-through” tax, because the merchant is only holding the taxes collected before remitting it to state and local taxing authorities at a set time (usually either monthly, quarterly or annually depending on gross sales). State and sales tax funds are used to fund state projects and initiatives, including schools, roads, public safety departments, etc. Many states get a majority of their revenue from sales tax, which is one reason they’ve been taking a closer look at ecommerce sellers. (More on this in the Current Sales Tax Issues Facing Ecommerce Sellers section). In the U.S., there is no “federal” sales tax. Instead, individual states administer sales tax. Because of this, all 45 states (and don’t forget D.C.!) that levy a sales tax have different rates, rules and laws. Sales tax rates can vary by county and locality, too. While this comprehensive guide will walk you through many common scenarios, always remember that you should contact an accounting professional about your specific company and situation. Your state’s taxing authority (generally called the state’s “Department of Revenue”) can also answer general sales tax questions. 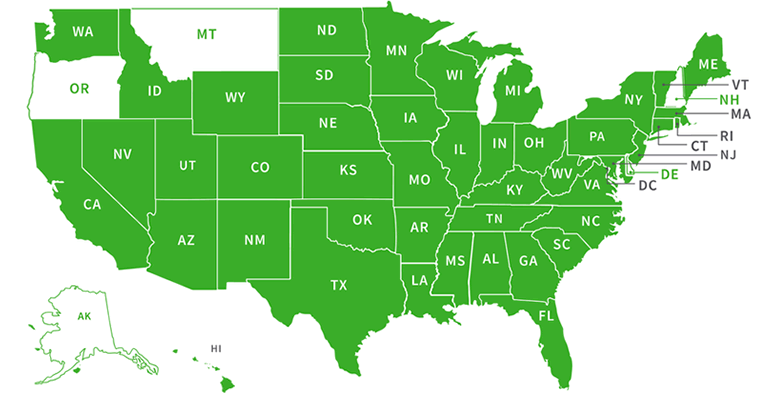 Here’s a map with info on how to contact each state’s taxing authority. We already covered the “why” of collecting sales tax: it’s the law and states require it. But who collects sales tax? From where do you collect sales tax? When do you have to collect and remit sales tax? And what amounts do you have to collect? Let’s dig in. You are required to collect sales tax in a state where you have sales tax nexus. Sales tax nexus is just a fancy, legalese way of saying “significant presence” in a state. Have an office in the state (including a home office). Have a contractor or salesperson in the state. Store inventory, have a warehouse or distribute your products from a warehouse in the state. Do business in the state such as at a craft fair or tradeshow. Have an affiliate in the state. Drop ship from a 3rd party provider in the state. Like we mentioned above, states generate a good deal of their revenue from sales tax. So it’s in their best interest to collect as much sales tax as possible. For this reason, most states interpret sales tax laws as broadly as possible. You live and run your ecommerce business in Texas. Because you have a physical presence in Texas, you have “sales tax nexus” there, and therefore are required to collect sales tax from buyers in the state of Texas. You live and run your ecommerce business in the state of Florida, but you hire your sister in Georgia to help you. Because you operate out of Florida and have an employee in Georgia, you now have sales tax nexus in Florida and Georgia and must collect sales tax from buyers in both states. Most states have ruled – either definitively or vaguely – that 3rd party fulfillment constitutes nexus. This means that if you store your goods in a warehouse in a state, then that constitutes sales tax nexus. So if you live in Wisconsin, but store your goods in California for the purposes of faster shipping, then you have sales tax nexus in both Wisconsin and California. Example #3 can be especially cumbersome for more complex ecommerce business, such as Amazon FBA sellers, whose goods may be stored in all 16 states (and counting) where Amazon has a fulfillment centers and where states charge sales tax. Using 3rd party services can create a huge administrative burden on unsuspecting ecommerce merchants. If you have questions about whether or not you have sales tax nexus in a state, contact a reputable accounting professional or your state’s department of revenue for clarification. So you have sales tax nexus in a state. Now what? Long story short, you’re required to collect sales tax from buyers in that state. But, as with everything sales tax, how much you collect is not that simple. Your first order of business is to get legal with the state, and register. States require any merchants who sell taxable items in a state to register for a sales tax permit. You’ll find registration instructions at your state’s department of revenue. These permits are usually either free or fairly cheap to obtain. States consider it unlawful to collect sales tax in their name without a permit, so don’t skip this step. A note on taxable items: Some items aren’t subject to sales tax in certain states. For example, most clothing is tax exempt in Minnesota, while grocery items are tax-exempt in Arizona. Always check with a state’s department of revenue if you suspect you are selling tax-exempt items. In general, states get very strict about the definition of a tax-exempt product. Your next step is to determine how much sales tax to collect. Once again, this is easier said than done, especially for online sellers. States set a sales tax rate, and then localities can add a percentage on top of those rates. For example, in the 90210 zip code, the tax rate is the 6.5% California state-wide rate, a 1% Los Angeles County rate, and an additional 1.5% local rate, for a total of a 9.0% sales tax rate. If you run a Beverly Hills boutique, then your sales tax compliance is easy enough. You’d charge 9% sales tax to a buyer. For example, if someone bought a $200 pair of sunglasses in your boutique, you’d charge them $218. That’s $200 for the sunglasses and $18 in sales tax at the 9% rate. But this can get tricky for online sellers, especially sellers with sales tax nexus in multiple states. This is because the rules are different for sellers selling to buyers within their own state (where their business is based) vs. sellers selling to buyers in other states where they have sales tax nexus. When it comes to determining tax rates, most states fall into one of two major buckets: “origin-based” sales tax states and “destination-based” sales tax states. In layperson’s terms, this means that some states require in-state sellers to collect sales tax at the rate effective at the point of “origin” (i.e. your office or place of business) while most states require in-state sellers to collect sales tax at the rate of the “destination” (your buyer’s address). Here’s a map of origin-based and destination-based states in the U.S.
Now that you’ve wrapped your mind around that, let us caution you that this map only applies to sellers selling within their own home state. To make matters more complicated, most states are destination-based when it comes to out-of-state sellers. You live in Texas (an origin-based state) and sell to a buyer in Texas – Let’s say you live in (or have a warehouse or office in) Irving, Texas, but sell to someone in Archer City. Texas is an origin-based sales tax state, so you would charge any buyer in the state of Texas a rate of 8.25%. (That’s Texas’s state-wide 6.25% rate plus Irvin County’s 1.0% plus a local Dallas MTA rate of 1.00%.) You do not need to take your buyer’s address in Archer City into account. You are based in Georgia but sell to a buyer in Tennessee (an origin-based state) – This scenario assumes you have sales tax nexus in Tennessee (perhaps you sell through Amazon FBA.) This is where things start to get complicated for out-of-state sellers. Even though Tennessee is considered an origin-based state, you, as a seller based in Georgia, would charge your buyer the sales tax rate at her “ship to” address in Tennessee. For example, say you are based in Albany, Georgia and your buyer lives in Maryville, TN. You would charge her the 9.75% Maryville tax rate. You live in Florida, but sell on Amazon FBA and sell to a buyer in Arizona – You have sales tax nexus in Arizona because Amazon FBA stores your products in a warehouse in Phoenix (Maricopa County.) If you sell to a buyer in Arizona, you would charge them the sales tax rate based on the location of the Phoenix warehouse, not based on the buyers location. Remember, this method is only valid for these three states: Arizona, California, and New Mexico. We hope this explanation didn’t send you screaming for the hills. Sales tax is complicated. Luckily, most online platforms will assist you in collect the right amount of sales tax. However, it’s always up to you – not the channel(s) you sell through – to determine if you are collect the correct amount of sales tax from your buyers. We’ll say again that it’s generally a good idea to contact a good accounting professional if you have any questions about your specific business situation. By now you’ve secured your sales tax permit and figured out how much sales tax to collect. Your next step will be remitting the sales tax you’ve collected to the state or states where you have sales tax nexus. Make a note of the sales tax due dates your state’s department of revenue provides when you register for a sales tax permit. You might find that one state wants you to file a sales tax return every month while another only wants to hear from you every quarter. Before you can file, you must figure out how much sales tax you’ve collected. Once again, this isn’t as straightforward as it sounds, even if you run a fairly simple ecommerce business. Figure out how much sales tax you collected through every channel you sell on. Figure out how much sales tax you collected in each state where you have sales tax nexus. In most destination-based states, breakdown how much sales tax you collected by county, city or other taxing jurisdiction. These steps can get really complicated and involve spreadsheets and tax tables. Or you can use our solution, TaxJar, and let us take care of all of these for you. We’ll import all of the sales tax you collected through all of your ecommerce sales channels and then break it down into sales tax return-ready reports. We’ll even file your sales tax for you. More about that in the next section. When it comes time to file, you have three options: you can file on paper (antiquated and slow), file online, or (if you use TaxJar) AutoFile. Since nobody wants to deal with paper any more, these last two versions are preferred by states. So we’ll deal with them. File Online – All states allow you to file online, and some states even require online filing for certain sellers. AutoFile –If you elect to sign up for AutoFile, TaxJar will automatically report, file and pay your sales tax due for you. No more dealing with math errors, spreadsheets and tax rate tables. You won’t even need to remember your state department of revenue password! No matter how you choose to file, be sure to pay on time. Penalties for late payment or failure to file can get steep. Nobody wants to pay a $50 penalty on a $2 sales tax bill. Some states require that you file a “zero return,” even if you didn’t collect any sales tax over the filing period. Some states will fine you for failing to file, even if you didn’t actually owe any sales tax. If you fail to file often enough, states may either take a closer look at your account to make sure you’re in compliance, or assume that you’ve closed up shop and revoke your sales tax license. There is one silver lining when it comes to filing sales tax – the sales tax discount. Some states realize that collecting and remitting sales tax is a huge burden on sellers, and they provide a small discount if you file early or on time. While these discounts are fairly tiny, they can add up. Don’t leave money on the table. If you choose to AutoFile with TaxJar, we’ll claim your sales tax discount for you. Here’s a list of states that provide sales tax discounts. You’re not sure where you have sales tax nexus – This is one of the big ones. If you have sales tax nexus in a state, but aren’t collecting sales tax, then that state has the right to audit you and collect back taxes plus penalties. Consult the “Sales Tax Nexus Checklist” if you suspect you may have nexus in a state. Here’s some info specifically for Amazon FBA sellers who aren’t sure about how selling on FBA creates sales tax nexus. You’re not sure when sales tax nexus begins – There are situations in which you may have products stored in a warehouse in one state and not even know it. We’ve heard from many Amazon sellers who shipped their products to a fulfillment center in one state only to discover that Amazon had sent that same inventory to another state, thus creating nexus they didn’t even know about. Keep track of your products. Specifically, if you use FBA, pull Amazon’s Inventory Event Detail report to see where your inventory is located. You can also use a paid service like WhereStock. You’re not sure when to register for a sales tax permit – Sometimes you’re not certain that you do enough business in a state to register for a sales tax permit. OR perhaps you think you’ve registered too late. This white paper walks you through When to Register for a Sales Tax Permit. The experts in the Sales Tax for eCommerce Sellers Facebook group are happy to provide general advice for these questions, and – we’ll say it again – contact an accounting professional for advice about your specific situation. Even though you may live outside the United States, if you sell on FBA or have established any other type of sales tax nexus in the United States (such as an office, a satellite branch of your business, or a warehouse where you store inventory), then you must comply by the sales tax laws of the state where you have nexus. One common misconception about U.S. sales tax is that if you live in a country with a tax treaty with the U.S., then you – as an ecommerce seller – do not have to charge sales tax to U.S. customers. Click here for more common questions and issues facing international sellers with U.S. customers. Internet Sales Tax – This is the big one. Many state and federal lawmakers and retailers are pushing for an “internet sales tax” that would force more – or even all – online sellers to collect sales tax from buyers on purchases made over the internet. The most famous version of the internet sales tax, the Marketplace Fairness Act, died in congress in 2014. But lawmakers in this federal legislative sessions are already gearing up to propose another internet sales tax bill. Proponents of internet sales tax claim that it will “level the playing field” between brick and mortar retailers, who always have to charge sales tax, and online sellers, who only sometimes do. Opponents maintain that it’s unfair to put more onerous burdens on ecommerce businesses. As of this writing, there is no active internet sales tax bill. But be on the lookout for one. You can be sure it’s coming. States Attempting to Collect Even More Sales Tax from Even More Ecommerce Sellers – States generate much of their revenue from sales tax. And many states are currently low on funds. Because of this, states are trying new and sometimes “creative” ways to collect as much sales tax as possible. For example, the state of Colorado attempted to require out-of-state online sellers selling into Colorado to report any Colorado buyer who bought an item tax-free. Colorado was then going to require those Colorado buyers to remit “consumer use tax” to the state. This, of course, would have put an unfair burden on sellers outside of Colorado. Fortunately, this rule will likely be struck down by the Supreme Court, but it goes to show you how far states will go in their attempt to collect as much sales tax as possible. We keep an eye on these nexus claims over at the TaxJar blog, so subscribe or check back often for sales tax news and updates. Sales tax is complicated. But when you’re armed with the basics, it does get simpler. And now that you’ve taken the time to digest all that, go relax, eat a pizza or play a round of golf. You’ve got this. Mark Faggiano is the founder and CEO of TaxJar, a service built to make post-transaction sales tax compliance easier for Etsy, Amazon, Shopify and other multi-channel ecommerce sellers. Mark’s passion is solving complex problems for small businesses. Sign up for a 30-day free trial of TaxJar and put a lid on sales tax! I’m ashamed to say that I thoroughly enjoyed this article. Can you explain what the sales tax requirements would be for ecommerce vendors that have no nexus in a state, but whose orders are all drop-shipped from manufacturers that do have nexus in that state? C’mon Ray! Nothing to be ashamed of. Just goes to show what a mess the US system is due to our origins as separate countries. I’m lucky in that Virginia is fairly straightforward. I thought that but as a Brit didn’t like to say… for the United States you aren’t very United! True Andy. Of course, Our taxes our still less than the UK . Practical comments – I Appreciate the insight . Does someone know if my business could get access to a blank 2015 FL DoR DR-15 version to type on? I assume that is a local tax form. Your state’s website should have blank forms you can print. I have an online store and use paypal. But I live in Oklahoma which is a destination state. Paypal requires tax rate set up by state or zip code. Since tax is calculated according to delivery of product, I attempted to enter all the zip codes and varying rates. However, I hit a snag once I discovered that some zip codes cross county lines creating different rates for the same zip. My question is this…is there a payment gateway that is more compatible with destination based sales tax rates other than paypal? Unfortunately, PayPal isn’t very helpful when it comes to sales tax. This blog post details some ways that eBay sellers (who use PayPal) get around it: http://blog.taxjar.com/sales-tax-on-ebay/ But I understand this isn’t ideal. If you have access to developer resources TaxJar’s API is the way to go. You can find out more about it here: http://www.taxjar.com/smartcalcs. Other than that, I’d be interested in hearing from others of any other payment gateways that are more flexible when it comes to sales tax. Hi Mark, very interesting article…! The “tax topic” seems a quite complex one in US. I have a question for you, if you can help me: we are a European company which have just opened a branch in Stamford (Ct) to sell our product (interior stairs) throughout US. We about to open an e-commerce but we are not sure about the “tax policy”: do we need to include it in the retail price? How much would it be? In Europe is quite simple: you just consider the VAT of the producer…so if you are French, you can sell in Spain using the French VAt…how we should proceed? Also, Sylvia Dion – http://www.sylviadioncpa.com – is a sales tax specialist who focuses on international businesses. If you need help, I highly recommend her. I’ve recently opened my small online business in Texas. I have an online store (on shopify platform which auto calculates texas tax rates) and I was told I only have to collect sales tax from purchases within Texas and not any other state. That seems odd to me, but would like your thoughts? I recently received an online order from a buyer in NY and no taxes were applied to his order by Shopify, but for any Texas based purchases it does apply taxes. Hi Abbi – that all sounds correct. You’re “only” required to collect the tax when you have nexus in the state where the item is shipped. You have nexus in TX, so you need to collect. If you don’t have nexus anywhere else, then you do not need to collect in any other state. Thanks, Mark! So if an online retailer in an origin-based state (e.g. Utah) sells to an out-of-state internet customer in a destination-based state (e.g. MA), is it the Utah rate that applies, regardless of whether or not the retailer has nexus in MA? (Though in this particular case, the retailer DOES have nexus in MA). Do I need to apply for a sales tax license if our out of state sales representatives only sell to retailer with their own sales tax certificates? We collect the certificates to prove we did not need to collect the sales tax, but are they valid for us if we do not have our own license in each state? It seems ridiculous to pay for a keep up on a license that we would never collect sales tax on. It would almost be better to drop all our independent sales reps. I can’t counsel you specifically, but the two general rules are that you only need to apply for sales tax in states where you have sales tax nexus AND are selling taxable products. If you aren’t selling taxable products, then you won’t be required to register for a sales tax permit. That said, there may be more factors you aren’t taking into consideration, so I recommend that you consultant a sales tax specialist. We have a vetted list here: http://www.taxjar.com/sales-tax-accountant-directory/ I hope this points you in the right direction! I hope you could clarify this issue for me. Each time I call the Sales tax departments in a different state I get different answers. We are a CA corporation that acquired another company that has a manufacturing facility in Mexico. We hired a logistic company in El Paso to take care of all the vendors shipments and the paper work that is required to bring the items across the border. We are not present in El Paso. Our vendors ship our purchases to the logistic company or straight to Mexico. It is clear that inventory and manufacturing supplies would be exempt from the sales tax. What about day to day items that are not used during the manufacturing process or capital items, do we still have to pay the sales tax? Or can we dispute the charge? What can I refer to? Jenn from TaxJar here. You have a complicated issue on your hands, and while I can’t give you a determination on product taxability, but I can recommend Peisner & Johnson (www.peisnerjohnson.com). They specialize in sales tax and can also assist in international issues. I really hope this points you in the right direction. Hi Marc, we are a European company providing online dating services. We are currently looking to expandi our services to the US market but still operate to 100% from Europe. Do we need to charge sales tax? Hi Max, Jenn from TaxJar here. If you have nexus in a U.S. state, then that state will still want you to register for a sales tax permit and charge sales tax to buyers in that state. If you do determine that you have nexus, you’ll find it’s a bit more complicated when you’re international because you’ll need a tax ID number and a bank account that will allow you to transfer your sales tax payment to the state via ACH. If you need a good accountant, I recommend Peisner & Johnson – http://www.peisnerjohnson.com – for international sellers selling into the U.S. I hope this points you in the right direction! This article was super helpful but I do have a question. I run an online business where I sell products on Amazon, Etsy, and Ebay. I am looking for a program that will go through my sales on these and will calculate how much sales tax I owe to the state of Missouri. Right now I am having to go through all the sales at the end of the year and sort through zip codes, and its very overwhelming. Is there a product or service out there that handles this? Hi, I am looking to become a rep for a clothing company, selling clothes both via online sales and in pop up boutiques in my area. I live in PA which, while we have a 6% sales tax, it is not collected on clothing. I would sell direct from inventory I own and maintain in PA. My understanding from this article and research is that I would NOT need to collect sales tax on any of my online sales, whether shipping within PA or out of state. Am I correct in this thought process? Hi Brenda, I can tell you that in general if you don’t sell taxable items in a state then you don’t need to register for a sales tax permit and collect in a state. Also, you only need to collect sales tax in states where you have nexus. So it sounds from your scenario that you would not need to collect sales tax. That said, we don’t give specific sales tax advice so always point you to our list of vetted CPA’s in case you do have sales tax liability issues: http://www.taxjar.com/sales-tax-accountant-directory/ I hope this points you in the right direction! Hi So after all this, how can I know how to fill out the tax table in ebay? Hi, Thank you for the information in the article and I know this is a head spinning topic. I have a question regarding online sales where the product is a digital download. I operate out of NJ and sell an ebook. I am not sure: 1- Do I only collect and report NJ sales tax because I have a nexus here, and 2- Since NJ is Destination based, do I need to collect sales tax based on the buyer’s state and then have to report to each state I collect from? If that is the case, Do I need to register to collect taxes from all states that charge sales tax on digital products? It seems overly complicated. Great question! As with most things sales tax, whether or not digital goods are taxable varies from state to state. We have a blog post on this here: http://blog.taxjar.com/sales-tax-digital-products/ It looks like digital products like books, movies and music are taxable in New Jersey. I really hope this points you in the right direction! Hello,I am in the process of starting my online boutique. I called the department of here in Mississippi to find out about what permits I need.The person I spoke with told me I would need a permit for every state from where my buyers would be.I confused on if I would charge the MS tax or where the customers live? What if we were to open a webshop in state X and customers start buying from all over the country…how can you comply to sales tax if you do not know upfront were your customer will come from? Can you register afterwards at the state for a sales tax license? Or do you have to register to all states upfront? Is your solution combined with a payment provider? Hi Greetz, this is a great question! Fortunately, in the U.S., you are only required to collect sales tax in states where you have sales tax nexus. So for example, say you set up a warehouse in New Jersey. If that is the only place where you have sales tax nexus in the U.S., then you would only be required to collect sales tax from customers in New Jersey. Also, at TaxJar we integrate with payment processors like PayPal, Stripe, Square and others. I hope that helps! So when we would have our products for example only in our office/ warehouse in Tennessee and ship the from there directly to our customer. And we’d sell via our webshop, amazon and ebay to customers in all other states but Tennessee. Than we do not have to collect sales tax from those customers? Only from customers from Tennessee? Are those payment providers the most common in the US? Great questions! If you only have nexus in Tennessee, then you would only be required to collect sales tax from buyers in Tennessee. You would NOT be required to collect sales tax from buyers in any other states, because you do not have sales tax nexus in those states. There are many US payment providers, but PayPal and Stripe are two of the most common for online payments. I hope that answers your questions! We are a NY based online retailer, with 5 warehouse in different states. One of the warehouse is in Hong Kong who also shipped to different states including the 5 nexus states that we have. Do we need to collect sales tax from shipment coming from Hong Kong that we shipped to 5 nexus state buyers? Great question! If you have nexus in a stat, you are required to collect sales tax every time you make a taxable sale to a buyer in that state, no matter from where the shipment originates. In this case, if you make a sale to a buyer in one of your nexus states you’d charge sales tax even if the order ships from Hong Kong. I hope that clarifies! Just recently I started selling in groups on facebook and varagesale. I will only be selling local. I live in Tennessee. Do I need to collect sales tax or do I need to sell so much amount before I collect sales tax? Thanks for any help. Hi Joan and Jan, it’s Jennifer Clark from TaxJar. Since you’re located in TN and that is your home state, no matter how much you make, if you’re doing business in that state you should be collecting and remitting sales tax in your state. if you’re selling outside of your state you’ll need to evaluate if you have a requirement to any other states, but it sounds like if you’re sourcing from garage sales and only selling local that it won’t apply to you. For others reading with a growing business and outside of your state sales: You can have a physical requirement for sale tax in another state if you have things like an employee, a retail location, inventory in a warehouse, or a brick & mortar store. You can also have an economic obligation to any other state (if you meet what a state defines as a ‘threshold’ for economic activity. (In some states this can be 200 transactions or selling $100,000 into that state, etc.) These are both referred to as economic and physical “nexus.” You’ll need to take a look at your business and determine if you have either of those and that will determine where you need to collect, remit and pay sales tax outside of your home state.